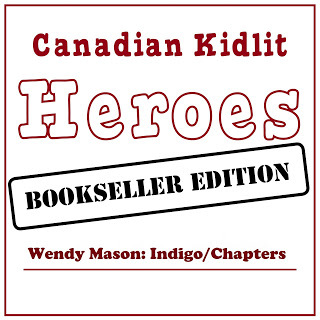 Wendy Mason is a Children’s Specialist who has worked for Indigo/Chapters since 1996. 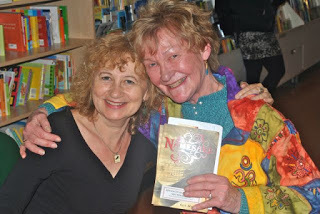 She was nominated by a grateful author to be today’s Candian Kidlit Hero. What led you to become a bookseller? My years spent teaching at the elementary, undergraduate and graduate levels focused on how to use books for cross curriculum purposes. It was a natural transition to engage in the retail environment of recommending, guiding, advising and selling. My focus rests primarily on the excellence of Canadian authors and illustrators. What is your favourite part of selling kids’ books? My favourite part about selling kids’ books is the engagement I have with my customers be they children, young adults, parents, grandparents, other relatives, teachers and librarians. Do you host author events in your store? I host author and illustrator workshops at Indigo/Yorkdale. What makes them special? Publishers who are kind enough to send me comp copies for the teachers attending so that the students come prepared for the Q.&A. session, Indigo staff who set the stage and my manager Paul Jones. Can you share a favourite story about being a bookseller? Favourite story about working as a bookseller would be the joy of having customers return to tell me that the books I recommended were perfect and then to ask for more. What would you like our readers to know about your store? Indigo/Yorkdale Children’s and Y.A. department is a welcoming place with a diverse variety of titles offered for all tastes in genres. I have been blessed with the presence of so many illustrious Canadian authors and illustrators who are willing to share their brilliance with my teacher friends and their students. Marie-Louise Gay will be coming to my department in September and I have over 100 grades 1 & 2’s already booked. For more information about the Cooperative Children’s Book Center, visit their website at http://www.education.wisc.edu/ccbc. “JILL MACLEAN of Bedford, N.S., has written many young adult books, but her latest, Nix Minus One (Pajama Press, 296 pages, $15 paperback), is an exceptional novel that is not to be missed. Written in free verse, it explores the life and emotions of Newfoundlander Nixon Humbolt (Nix) between his 14th and 16th years. “MacLean’s poems capture moments of joy and pain equally well. Nix describes hiking the barrens with Twig, “At the crest, where the brook/meets the edge/and falls,/I straighten, panting,/ and turn around./Breath catches in my throat. The sun’s sinking over Labrador,/the gulf waxed gold.” And, later Nix is in the workshop ” thinking how I’ve dovetailed/guilt to grief–”. Congratulations to Alma Fullerton and Karen Patkau, whose picture picture book A Good Trade has been selected as a title for The White Ravens 2013. The White Ravens is a list of outstanding international books for children and young adults. It is selected annually by the International Youth Library in Munich, which receives submissions from over 40 countries. An online catalogue of this year’s selections is forthcoming. To learn more about The White Ravens, visit the International Youth Library website. We are pleased to announce that No Shelter Here: Making the World a Kinder Place for Dogs by Rob Laidlaw has been nominated for the 2013-2014 Hackmatack Awards. The Hackmatack Awards are Atlantic Canada’s children’s choice reading awards for students in grades four to six. For more information about the program, visit www.hackmatack.ca. Congratulations to Rob Laidlaw for this nomination. Young “Dog Champions” across the country will be celebrating this news. To mark the American publication of A Good Trade by Alma Fullerton and Karen Patkau, Pajama Press is releasing a brand new book trailer. Click on the link below to view the video. You can also view the trailer on YouTube. “MacLean, the award-winning author of The Nine Lives of Travis Keating, The Present Tense of Prinny Murphy and Home Truths, has a serious track record for developing wonderfully drawn, multi-layered teen characters and this book is no exception. This is the Bedford author’s first book done in free verse, however, which seems to help give it an extra layer of emotional resonance. Click here and scroll down to see the full review. 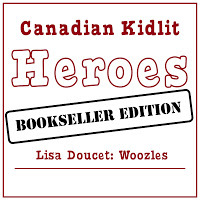 Lisa Doucet is the Co-Manager of Woozles, a children’s bookstore in Halifax, Nova Scotia, where she has worked for the last sixteen years. As today’s Canadian Kidlit Hero, Lisa shared with us some of her stories and experiences—and a lot of her passion. It was actually a happy coincidence that I ended up at Woozles. Prior to working here, I had worked as the Retail Manager at the Discovery Shop, the gift shop at our local science centre. One of the first people I met when I began that position was Trudy Carey, who was the Manager of Woozles until her retirement four years ago. When I eventually left the Discovery Shop and was doing volunteer work at a local dance studio, Trudy suddenly found herself with an opening for a full-time bookseller at Woozles. Knowing me through my work at the Discovery Centre, she offered me the job at Woozles in the changing room at Halifax Dance after a lunch hour dance class! 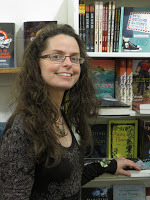 It soon felt like I had always been meant to work at Woozles: my life-long love of reading (and enormous passion for Anne of Green Gables and all of LM Montgomery’s books), as well as my enthusiasm for working with people had found the perfect home. What is your favourite part about selling kids’ books? Do you host author events in your store? What do you do to make them special? We occasionally hold specific sorts of author events in our store, or often we will collaborate with another group to hold an event. For example, Sacred Heart School that is very nearby and has many lovely spaces for hosting various types of events. We recently had a Storytime Pajama Party at the store where author Sheree Fitch came and read stories to a store full of rapt children and parents. Illustrator Sydney Smith joined us for the festivities which helped make the evening special. We served milk and cookies, had a prize for the best pajamas, we gave out a little gift to each person who came in pajamas and had a couple of special prize draws taking place as well. This was all part of a larger event that was taking place, Spring Garden Road’s “Shopping Under the Stars”. Can you share a favourite story about working as a bookseller? I have so very many favourite stories about working as a bookseller but maybe one that is nearest and dearest to my heart (and the most long-lasting one) is a particular relationship that I have established. When I started at Woozles 16 years ago, I soon became the go-to person to help a particular customer select books for her three young grandchildren. The oldest and I shared a particular fondness for fantasy books and I became the person who would get books ready for her whenever she needed them for all three of them. Since then, there have been six more grandchildren and I have had the pleasure of watching all ten of them grow up. I have witnessed as they’ve made their bar and bat mitzvahs, won awards, graduated high school. None of these grandchildren live in Halifax, and every August, at some point, the entire family comes to Halifax and there is a designated Woozles day. And I wait, anxiously, until the first one of them bursts through the door and this family that has come to mean so much to me comes pouring into the store with all of their energy and joy and stories of the past year, and they surround me with all of their love for each other and for books and with their cries of “Lisa, help me choose one now! Lisa, have you read this one…” This grandmother is now a dear friend and they all are such a special part of my life. They are one of the many reasons that I feel so fortunate to have found “my calling” here at Woozles. What would you like our readers to know about your bookstore? I would like people to know, if they don’t already, that Woozles is truly a magical, very special place where books are cherished, people are also cherished, and friendships are made. Everyone at Woozles believes in the importance of what we do, loves that we get to do it and has a deep respect for the significant role that Woozles has played in the lives of so many people (children and adults alike) for the last 34 years. Almost 35, in fact. Woozles will celebrate its 35th birthday in October of this year so there will be major festivities to mark that occasion!